Thuja Occidentalis 'Degroots Spire' is a moderate growing shrub, tree and cone bearing plant that can be grown in USDA Plant Hardiness Zones 2A through 8B. It matures to an average height of 12 feet to 15 feet and an average width of 1 foot to 2 feet, depending on climate and other environmental factors. It prefers growing in a location that provides full sun and grows best when planted in sand, loam, clay or silt soil that is well drained. The foliage is dark green in color. It attracts visual attention and is resistant to deer, drought and heat. Degroots Spire Arborvitae can be useful in the landscape in foundation plantings, as a buffer or screen, as a background, in shrub borders, around decks, swimming pools, and other outdoor living areas, for topiary, as a focal point, in landscape beds or islands, to frame the corners of a home or other building or to accentuate entryways and also in theme gardens. Got a narrow space you need to fill? 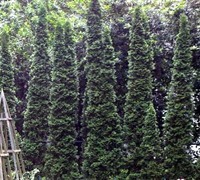 If so, Degroot's Sprie Arborvitae might just be the perfect choice. 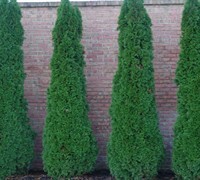 Degroot Spire is a very narrow growing evergreen conifer with a slightly asymetrical form. The wavy, dark green foliage is very attractive year round. 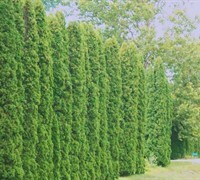 Degroot's Spire Arborvitae has a somewhat formal look to it which makes it a fine selection to accentuate entryways, for narrow spaces in foundation plantings, to line driveways, or create a formal but low maintenance tall hedge. Also performs quite well in large containers where it makes a very nice centerpiece. Also useful a a stand alone specimen. This plant is a native of the Eastern US. It likes full sun and prefers average to slightly acidic soil that is moist but well-drained. Quite drought tolerant when established. No pruning necessary! Feed with a well-blanced shrub and tree type fertilizer in spring. Precisely what I wanted, and delivered carefully after selection by agent. I would order again with no hesitation. It was nicely packaged and very healthy looking. The whole process was friendly, fast, and hassle-free. Spencer was very helpful and my plants arrived in beautiful condition.Thanks!